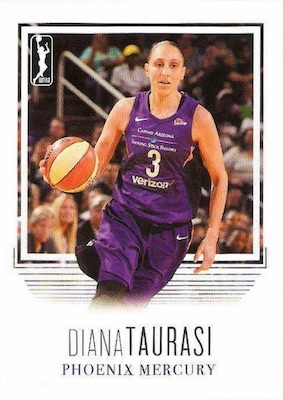 2018 Rittenhouse WNBA Basketball has a little something for both set collectors and hit collectors, as each factory box features two inscription autographs to go along with a full base set. 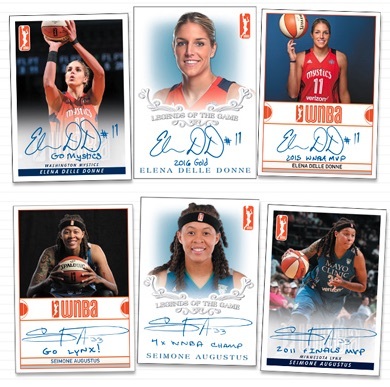 Again working with a more premium format, the 2018 WNBA trading card set promises two autographs from a group that includes A'ja Wilson, Elena Delle Donne and Seimone Augustus. With 110 cards, the comprehensive 2018 Rittenhouse WNBA Basketball checklist offers at least seven players for all 12 teams in the league. Every factory set includes the full base set. Also inside each box are two different inscription autographs. Guaranteed in each box is one of three different image versions for rookie A'ja Wilson, the first-overall pick in 2018 by the Las Vegas Aces. 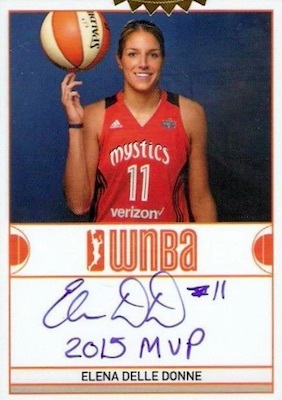 The second signature is either for WNBA stars Elena Delle Donne or Seimone Augustus. All players have three signed card options, including Game Action, Posed in Uniform and Street Clothes, plus various inscriptions. Limited to 500 boxes, retail pricing for 2018 Rittenhouse WNBA Basketball is $169.99. 110 cards. Full set per box. 2018 wnba set+3 autos,a'ja wilson,elena delle donne,seimone augustus,sale!!! 2018 wnba set + 2 autographs,a'ja wilson,elena delle donne or augustus special! !